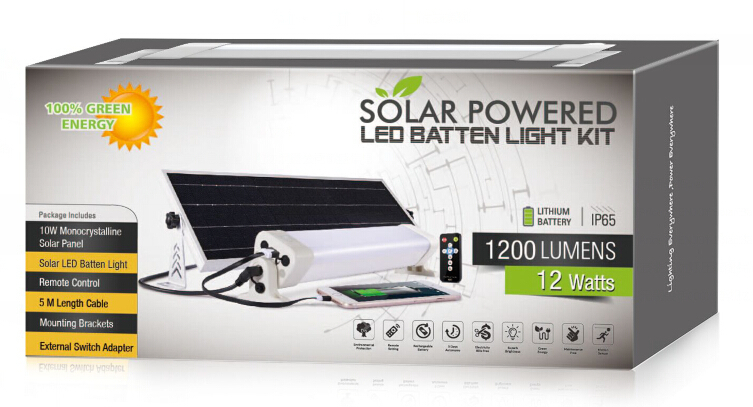 • What is solar led batten light kit? 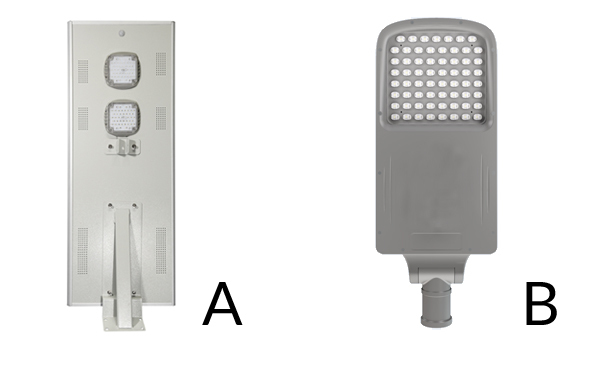 • What is the core factor for solar led street light? • Why we say there are some the fake data of solar light? 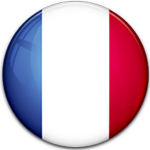 • How to calculate the power concumption of solar light? 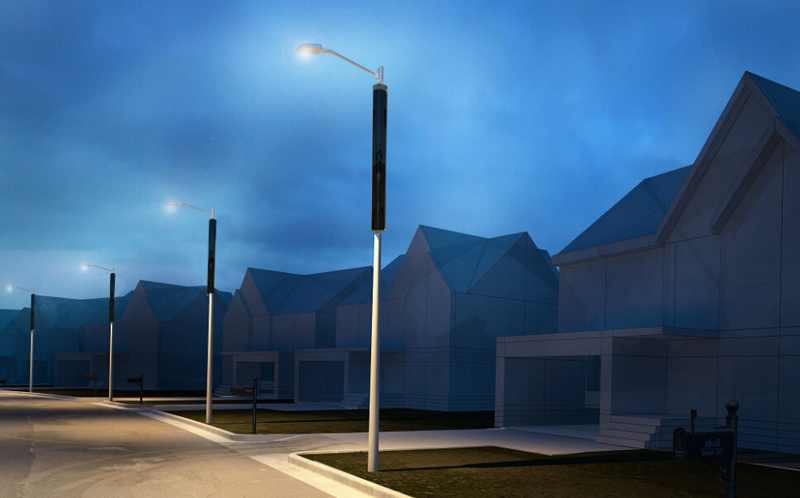 What is the cylinder solar led street light? At present, regular flat solar panel are adopted for all kind of solar led street lights on market, it has a good power and can meet most of projects' requirements. But in some cases, regular solar panel is not a good option, for example. When led power is 80W or more, solar panel will need 200W, but size of 200W solar panel is huge size, the installation performance is very ugly. In windy areas or countries, regular solar panel with big size is too easy to be blown off or damaged, It could be worse especially when typhoon or other very bad weathers. The hexagonal design ensures maximum exposure in the morning and afternoon, greatly increasing the amount of electricity generated. (Cylinder) Cylindrical solar street light is an great innovation in 2019, 6 slim solar panels are fixed on a hexagonal cylinder aluminum frame. It has a much stronger performance in wind resistant. and it makes the complete solar pole more beautiful than regular solar panel. Auroras's cylinder solar panel is a modular panel which can meet different power as requested. 1:ALL IN ONE solar led street light. Split type is a traditional system which has been used for many years, normally it use lead aicd battery or gel battery which are always buried in ground. 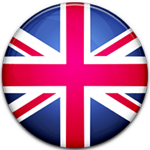 The advantages is the maintainence is easy and fast. the disadvantages are: the lifetime of such battery is always short so it require a very big battery, because the discharge depth of lead acid battery is 70% around. and its lifetime is about 200-300 cycles normally. the other issue is: it requires prefessional technician to connect the cables or it will have many problem if any mistakes on wiring work. 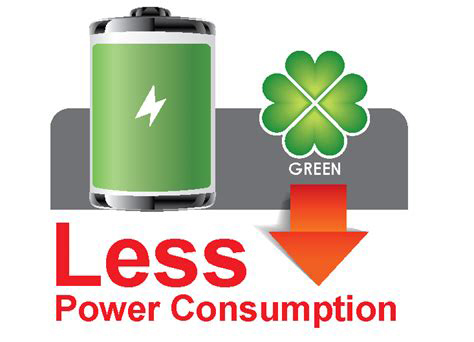 Now there are some company also use lithium battery instead of lead acid battery. but it is not a lot on market. Because the labor cost for cabling isa headache and customers do not like it. Such light is an combination of all new technology.It has the advantages of ALL IN ONE type and it avoids the disadvantages of split type. Lithium battery and solar controller built inside of the light fixture as well as led chip. only solar panel are seperated which allow customer to use different powers as project require. There are only two parts of such light, only solar light head + solar panel which are connected by universal MC4 plugs. Anyone can do this connection easily without any mistake. 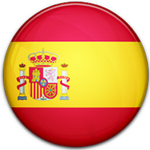 in some regions, there are many problem that battery are always stolen when put in groud. Because such the lithium battery are inside of light head,so it is very safe and nobody can steal it. This is a very big concern in some regions when customers consider about their project. As we know your company is working on serious goverment project. 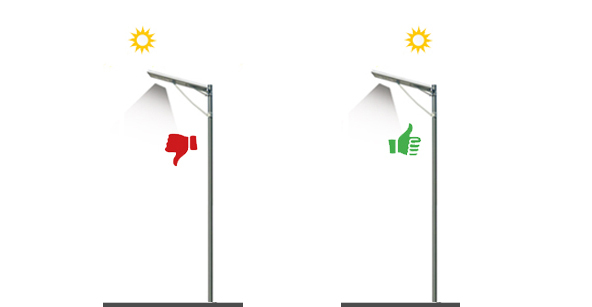 so we believe all in one solar street light is not a good option for your project. split type is a reasonable option if you have good technicians. while there are so many different modles and competitors and quality of such type are very various.In my opinion this type will be out of date gradually.and all the light will be semi split. because it is very easy to install and have good performance in lighting. Our company has been focusing on high quality solar products which are for commercial. We have supplying thousands full set of solar street lighting for UN in past years. For commercial solar lighting, it must has a big battery which can make light work 100% for 12 hours at least. Only with this specification, the light can work well even in winter or cloudy days. There are many low price products even some companies declare "high data" in their data sheet. so i really hope you will be able to tell which is real and which is not. Now We have developed full range of Semi Split type which covers different powers from 20W to 150W. Our latest model is THOR, it is specially for high way. and it has a very big battey capacity which can allow light to work 24 hours with 100%. We can make the design for your project if you like. 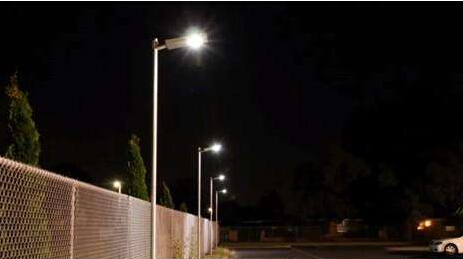 From recent years, solar led street light is becoming more and more important and its demand has been increased a lot. There are more and more factories who start to product solar street light, There are various models of solar lights with different specification, and main problem is there is not a very clear standard of quality or specification to refer to. 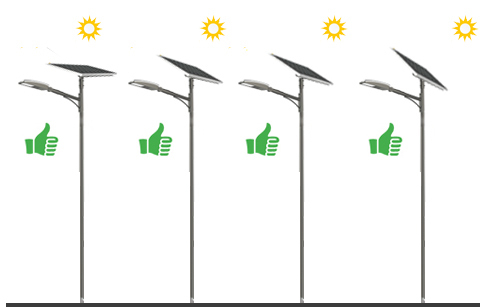 So, how to compare the quality of different solar street lights and choose the right one for your project? What is the biggest concern that you need to focus when you compare? Our answer is light efficiency. Such two solar lights are both called “500W” while the efficiency is much different, All in one solar led street light is only working in 50% power actually, and its efficiency is about 3000lm~4000lm in energy saving mode. But B type with 240pcs led, our model can work well with 100% power and lumens is 8000lm. 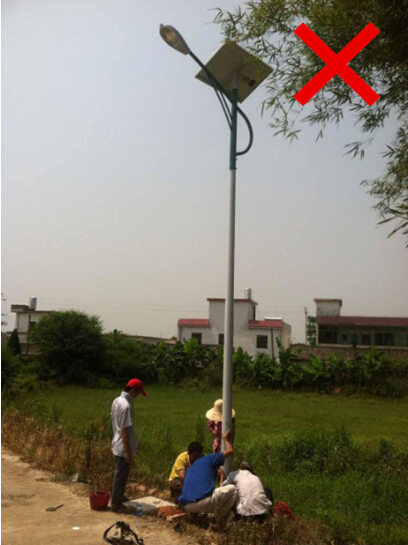 It is more than doubled than normal all in one solar led street light. So when you select the solar lights for project application, lumens efficiency per watt is the most important concern , not the power led LED. We provides solar led street light from 2000lm to 18000lm as full range of solar lighting powers as optional. We will reply to you within 24 hours once we get your inquiry. Do you receive such feedback from clients? The solar street light doesn’t work. Or the lamp only can work 2~3 hours each night. What happen to these solar street lights? Except the reason of parts that broken down, here are some mistakes when installing solar street light which may cause such matters too. Some front-line installation person don’t have much knowledge & technology of solar street light, then install the solar street light at their own sweet will. In this case, sometimes solar street light can not charge or can’t get full charging. 1、The solar panel is installed under/near some obstructions. Such as some wires, tree branch, lamp pole or others, that cause some shadow on the solar panel at daytime. Usually, the solar cells are multi series-wound. If there is one shadow on one series of solar cell, and the shadow is deep, then the circuit of this series is broken. At last affects the solar panel to absorb sunlight and shorter the working time of solar lamp. 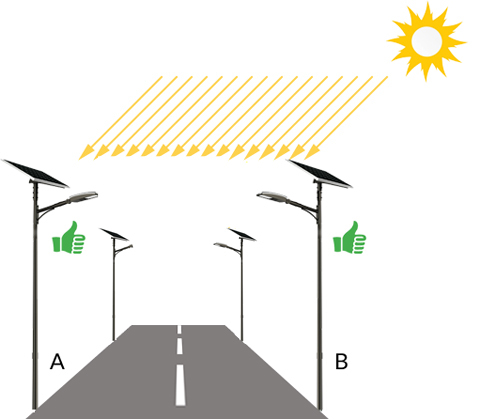 2、The solar street light is installed near other lamps. As night fell, another lamp turn on, solar street light will detect the light source and misunderstand itself is on daylight, so the controller won’t let the light lit up. 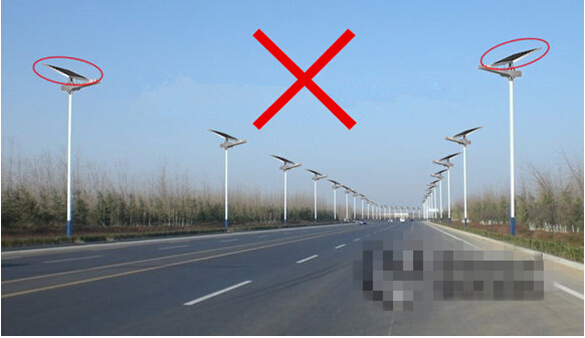 The reason is the charging voltage of solar panel always is higher than than the voltage point of light-control, so the solar street light can not turn on. So should not install solar street light near a workable lamp or should turn off other lamps like the following picture. 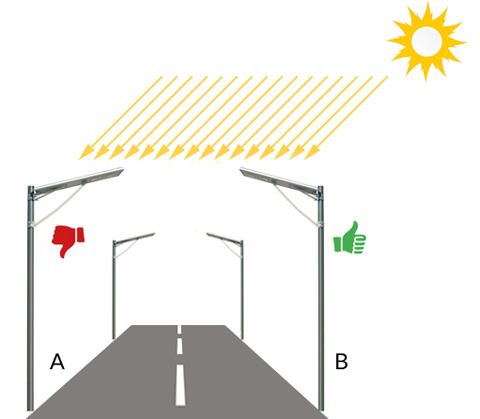 3、The solar lights are installed on both sides of the road, but the solar panel is face to face or back to back. For symmetry and looks good, some installation person will adjust the solar panels of two sides with an opposite directions, for example one side is in the face the east, another side is in the face of the west. If one side is correct, that means another side is wrong. And then the solar panels in wrong direction can not get more direct sunlight, thus the charging efficiency become lower. 4、The angle of solar panel is unsuitable that cause low charging efficiency. The principle of adjusting angle of solar panel should be: let the sunshine direct radiate on the solar panel as much as possible, in this way the charging efficiency is the maximum. 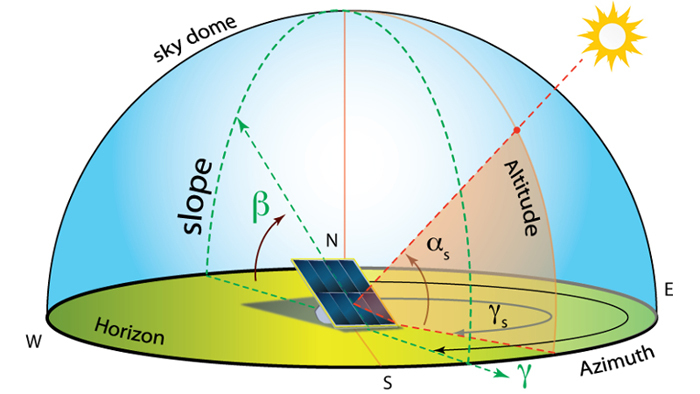 When adjusting the the angle of solar pane, should take the local latitude into consideration. There is a quick way in most cases, what the latitude is, what the horizontal angle of solar panel is. But still should concretely analyse different situation. On the whole, the angle of solar panel is very important too. 5、Solar panel is charging indoor. Some client will install the solar lights into the warehouse or parking lot as well as solar panel. That is inexpedient. Under such circumstances, should put the solar panel in outdoor to get full charging. That need to install the solar light and solar panel separately. 6、Lengthen the cable of solar panel at random. There are maybe some obstructions or interference, thus some people will install the solar panel on a position that is far away from solar light, such as 20 meters. And they use normal two-core cables to connect it. Since the quality of normal cables on the market is not very good, while the distance of installation is long, there will have big power loss, finally affects the lighting effect and working time of solar light. 7、Use the remote control incorrectly. Some remote controls have simple functions while some have complex and diverse functions. According to some feedback, some installation person or end customer don’t know the operation of remote control, but press the button carelessly that caused parameter setting error. So the solar light don’t work. For moment, there is not standard for solar light on market. basically we suggest to use 100W solar panel if you are using 50W led light. if you only use 60W or 70W solar panel, that will make the power generated from solar panel not enough to support led light consumption. In conclusion, when installing all solar lights, should read the manual or installation guide carefully and get more opinion from professional person in order to avoid some mistakes or irreparable error.